THIS SUMMER, as millions of us set out to explore America, we’re inviting you to think about images of our country that have inspired men and women over many years. Images of America is one of the Free Resources used by groups nationwide to discuss United America. If you click on that book link, you’ll find the full Photo Gallery with more than 100 famous images like the 5 we’ll look at in depth this week in OurValues. We’ve carefully chosen images that can be freely reposted, printed and shared for discussion. Please, use this week’s OurValues series as a convenient introduction to help get friends talking about United America and the 10 values that really do unite nearly all of us in this nation. Today’s question: Who’s that man in the picture? More than half a century before the current “Black Lives Matter” campaign for racial justice, Dorie Miller embodied a closely related idea in a startling new way for millions of Americans who found themselves in the midst of World War II. At the time, most Americans were barely aware that African Americans were part of our armed forces—let alone risking their lives with such heroic distinction. Doris Miller, born in 1919, is far better known by his nickname Dorie. He was a cook on the battleship West Virginia at Pearl Harbor on December 7, 1941. He had just finished serving breakfast when the first of nine Japanese torpedoes hit his ship. Like other crew members, when the attack began, Miller raced to his assigned battle station: an anti-aircraft battery that he discovered had already been destroyed. Everyone aboard was in shock from the extent of the carnage the ship and the crew already had suffered. A commander spotted Miller and told him to help with the ship’s captain, who was so gravely wounded that he would not survive the day. Miller stood 6-foot-3 and was able to move the skipper to a more sheltered spot, where the captain tried to continue giving orders. Then, Miller was assigned to a different set of anti-aircraft guns. Despite problems with that equipment, Miller soon was firing the big .50-caliber machine guns skyward. Later, Miller helped move and evacuate wounded survivors, saving many men who otherwise would have perished in the smoke, fire and rising sea water as the fatally damaged ship sank. “Dorie” Miller with his Navy Cross. Miller was the first African American to receive the Navy Cross. He was celebrated coast to coast as an iconic figure in the nationwide campaign to mobilize all Americans in the war effort. In particular, the poster designed by David Stone Martin (“Above and Beyond the Call of Duty”) was proudly hung in African American communities. A Chicago native, Martin went on to produce many illustrations and paintings, some of which hang today in major art museums and the Smithsonian. Before his death in 1992, Martin was famous for designing album covers featuring Billie Holiday, Charlie Parker, Ella Fitzgerald, Harry Belafonte and many more artists. While Dorie Miller’s memory lives on to this day—he did not survive World War II. In 1943, he was killed in action when the USS Liscome Bay was sunk by a Japanese submarine. Talk about these images with friends! AMERICAN IMAGES say a lot about the values we share. This week, we’ve already looked at two pictures that get people talking about values that unite us. Now, we’re adding a third. Today’s question: Where are these people going? Titles vary in exhibitions when this famous 1908 photograph of a stairway at Ellis Island are displayed. The two most common are: “Climbing into America” and “Climbing into the Promised Land.” The photographer, sociologist Lewis Hine, also made the photo we looked at yesterday. Considering how easy it is to snap photos today, you may not appreciate how hard Hine had to work to create this image. So, yes, Hine did “pose” this photograph of a few of the more than a million immigrants who passed through the Ellis Island immigration center near New York City that year. He achieved this “pose,” most likely, by asking the men and women continuously streaming up this stairway to stop and look his way. Just a few of them agreed to look into the camera. One man appears to be lifting his paperwork perhaps to cover his face. The woman in the photo has decided not to look Hines’ way. Hines took about 200 photographs at Ellis Island between 1904 and 1909. His motive? Humanizing the sea of immigrants; showing the faces and illustrating the optimism of these men and women who, at the time, were dismissed by many Americans as impoverished rabble. Most Americans wanted to avoid these newcomers; Hines saw America’s future at Ellis Island. Today, looking into Hine’s Ellis Island photos, most Americans wonder: Could he have captured one of my own ancestors? A great grandfather or great grandmother? Some of the photographs in our United America gallery represent national symbols. These powerful, iconic ideas play a special role in American society. Most other nations are what we call birthright nations. The feeling of belonging to a “people” comes from common ancestry, history, customs, language, and religion. America, however, is not a birthright nation. The sense of belonging to the American people comes from a commitment to a set of ideas and ideals. Today, we’re looking at one of the major symbols of the 20th century: The Melting Pot. This particular image portrays an earlier—perhaps an out of date—form of cultural unification. It’s a poster for The Melting Pot, a play by Israel Zangwill that debuted to rave reviews in 1909. The Zangwill drama borrows from Shakespeare’s Romeo and Juliet, a tragedy about star-crossed lovers from two warring families. Zangwill set his play in New York City—a sort of West Side Story before its time—where the Romeo figure (named David in the play) is a Russian Jew who escaped an infamously brutal pogrom and the Juliet character (named Vera) is a Christian settlement worker, also a Russian immigrant. When “Romeo” learns that “Juliet’s” father directed the very pogroms he escaped, they are torn apart. Unlike Shakespeare’s tragedy, however, The Melting Pot has a happy American ending—the lovers reconcile. The idea of a cultural smelting pot, crucible, or melting pot can be traced back at least to the 18th century, but Zangwill’s play popularized the idea of America as a place where differences were dissolved into a cultural whole. Is this symbol still valid? Or is it out of date? Here are some of the thoughts about this Melting Pot image from a small-group dialog I hosted. Which of these comments is closest to your own reaction? “The drama now is how to maintain these values” and respect differences. Are you already feeling your spirits soaring for the Fourth? Foreign observers are always amazed at the near-reverence with which Americans embrace their symbols. But if you are American, you understand completely. Seeing the flag fly or hearing the national anthem makes just about any American feel good. Consider posting today’s photo on your Facebook page or simply email the link to this column to a friend. Conduct your own research. What are your friends saying about the patriotic symbols we encounter on the Fourth? Want even more patriotic fuel? Enjoy this video of the original 1814 music of our Star-Spangled Banner, a project coordinated by my colleague University of Michigan musicologist Mark Clague, an authority on Francis Scott Key and the Star-Spangled Banner. THIS WEEK, we’re continuing with our guided tour through the United America photo gallery Images of America as our way to celebrate these mid-summer weeks surrounding the Fourth of July. Millions of Americans are traveling, now, exploring our nation’s great diversity—including our National Parks and other natural wonders. It’s a perfect time to consider the values that unite us. But, examine carefully this chart of United America 10 Core Values. Then, look at today’s featured image from the Images of America photo gallery—one of the photos captured by NASA of our big blue planet. 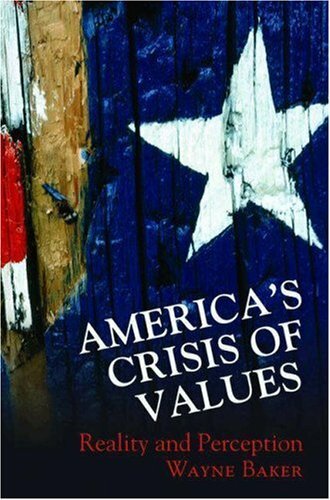 Today’s question: What’s not an American core value? A concern about the health of our environment. Despite the impassioned appeal of Pope Francis’s new letter on the environment, recent polling is showing relatively few worries about the health of our natural world. But we’re not united in this complacency. Many young children are terrified about the Earth’s future, according to a recent poll of American kids ages 6 to 11. A third worry that the planet won’t even exist by the time they grow up. A clear majority (56%) fear the Earth will be devastated by the time they grow up. The poll, commissioned by Habitat Heroes, also found that minority kids are the most worried: 75% of Black children and 65% of Hispanic children worry that the Earth will have deteriorated by the time they grow up. So, we’ve certainly done a good job terrifying our children about the world they will inherit. At the same time, American adults’ worries about the environment are near record lows, according to a new Gallup survey. Concerns about drinking water, air quality, rain forests, and global warming were the highest in from late 1980s to the early 2000s. Worries hit historic lows around 2010 and 2011, blipped up slightly, and then fell back in 2015. Today, 50% of Americans rate the overall quality of the environment as excellent or good—the highest since 2001. Want more fuel for a discussion about our environmental attitudes? In April, I devoted a week-long series to ideas for getting our kids to spend more time in the natural world—one sure-fire way to raise concerns for our planet’s well-being. IN OUR TOUR through the photo gallery Images of America, we began with images of core values universally held by Americans, as documented in the book United America. In Part 6, we looked at one of the milestone photographs of the 20th Century—a view of planet Earth from outer space—and discussed how concern over our environment is not a core American value at this point. Today’s question: What images of our natural world do inspire you? You’ll find a number of them in the photo gallery. Among them are examples of an almost-forgotten art project created within the Works Progress Administration (WPA) for the National Park Service. Within the Depression-era WPA, a special Federal Arts Project ran from 1935 until 1943—employing thousands of artists and eventually creating 200,000 works of art! A small unit in that program produced park posters from 1938 to 1941. That unit was just a drop in the ocean of artists working coast to coast. And, to this day, the full documentation for the park posters seems to be missing, including the name of the artist who created the silk screen poster for this once-again popular image of Old Faithful at Yellowstone. As the Park Service tells the story, the posters themselves nearly vanished. A dusty handful came to light while a ranger was cleaning out an old shed. The few people who saw them were inspired enough to recover and restore at least a handful of these beautiful images. Do these images inspire you? If not, then what images do move you to get outdoors?